What does it mean to us as American citizens to be free? Life, liberty and the pursuit of happiness is what I always thought up until this little piece of legislation dubbed the National Defense Authorization Act 2011 was recently passed mid December of this year. The N.D.A.A. 2011 permits the President of the United States to unlawfully detain American citizens without normal due process of law. That means our 4th and 5th Amendment rights in the Bill of Rights are absolutely nullified or non-existent. Republican GOP Presidential Candidate Ron Paul elaborates further on the ramifications of this invasive, draconian and inane piece of legislation for the people everywhere who appreciate democracy. But what definitively do these amendments in the Bill of Rights, that were put in place to protect U.S. citizens actually ensure for us as Americans? We are already being illegally searched and properties are seized at the T.S.A. checkpoints in the airports nation wide due to previous legislation like the Patriot Act passed during President G.W. Bush first term in office on October 26, 2001 after . On May 26, 2011 President Barack Obama signed a four year extension of three key provisions of the Patriot Act which are roving wiretaps, searches of business records (the “library records provision”), and conducting surveillance of “lone wolves” or individuals suspected of terrorist-related activities not linked to terrorist group. The N.D.A.A. in concert with prior pieces of legislation like the PATRIOT ACT have ensured that our civil liberties may be on thin ice. 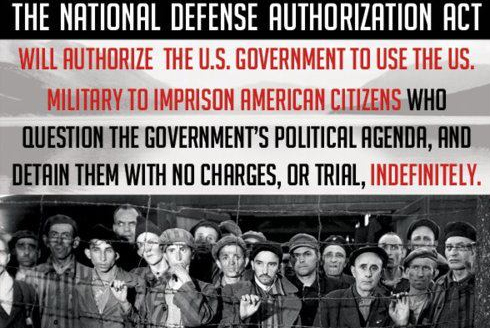 The American Civil Liberties Union (ACLU) noted that the National Defense Authorization Acts ability to indefinitely incarcerate American citizens is absolutely unconscionable and unconstitutional.